In other words, it's two in a row for Lizzy Stevens. 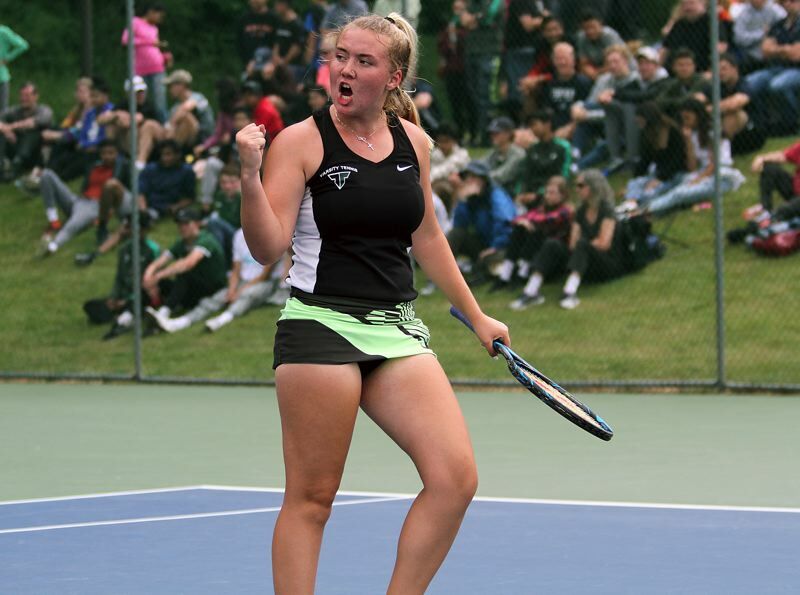 Stevens, a Tigard High School senior, won her second straight Class 6A state tennis tournament girls singles title, storming to a straight-sets victory in the championship match, held Saturday at the Babette Horenstein (formerly Tualatin Hills) Tennis Center in Beaverton. "I worked a lot harder this year," Stevens said following her 6-2, 6-0 victory in the girls singles title contest. "I wasn't sure if I was actually going to come back and play this year because I've been training a lot in California with online school and traveling a lot and it was a back-and-forth decision, but overall, I had state in my mind the whole time and that's what I really wanted to win." Stevens, as she has done throughout her two years at Tigard, got off to a roaring start at the state tournament. After drawing a first-round bye, as the No. 1 seed, Stevens faced a familiar foe in the second round, played last Thursday, as she took on Lakeridge senior Lilly Stephens, who she defeated in the 2017 Three Rivers League district tournament final. Stevens cruised to a 6-0 first-set victory in her state opener. Stephens won the opening game of the second set, but that's all she would get, as Stevens won the next six games to wrap up a 6-0, 6-1 victory. "It went pretty well, actually," Stevens said after that match. "I was happy with how I played. I was a little shaky at first, because I felt a little pressure, but I just played my game and stayed focused." Stevens also seems to have some fun, to go with her determination, in that opening match. "I'm really determined to get to the finals, so I know I have to stay focused, and focus on every point," she said. "Lilly and I are really good friends. It was fun to share the court with her." 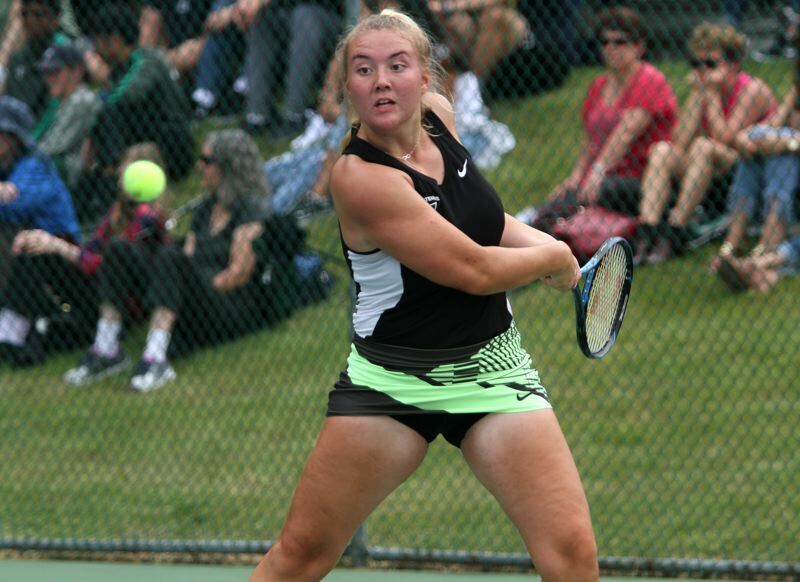 In Friday's quarterfinal round, Stevens rolled to a 6-0, 6-0 win over Roseburg sophomore Samantha Eichman. Later on Friday, in the semifinals, Stevens took on another familiar foe in fifth-seeded Mariam Nechiporuk. Just a week before, Stevens defeated the Lake Oswego freshman in the Three Rivers League district title match. It was more of the same in the rematch, with Stevens getting a 6-3, 6-2 victory to advance to the state finals for the second straight year. In the championship contest, Stevens faced Jesuit sophomore Farida Abdelmoneum, the No. 2 seed. And, as has been the pattern throughout her high school career, once Stevens got going, there was no stopping her. With momentum clearly on her side, the powerful Stevens powered past Abdelmoneum for a 6-2, 6-0 win — and her second straight state championship. I've been working on my fitness a lot and making sure I stay in the points and just stay focused and not worry who's across the net, just my play," Stevens said. "Farida is a great player. We've never played before so it was fun to be on the court with her and she's a lot of fun. I knew I had a lot of eyes on me this year so I really had to put that behind me and just focus on, I'm out here and I want to win. There's no pressure, it was just keep on playing." But, for Stevens, it seems to be more than just playing. "I'm going to remember everybody cheering for me," she said. "My friends are here, my family. It's great to have them here and they are a huge support group in my life. I am thinking about three (state titles next year). I love Tigard High School. I love representing their colors and I'm proud to be a part of Tigard High so I'm definitely thinking about coming back next year." 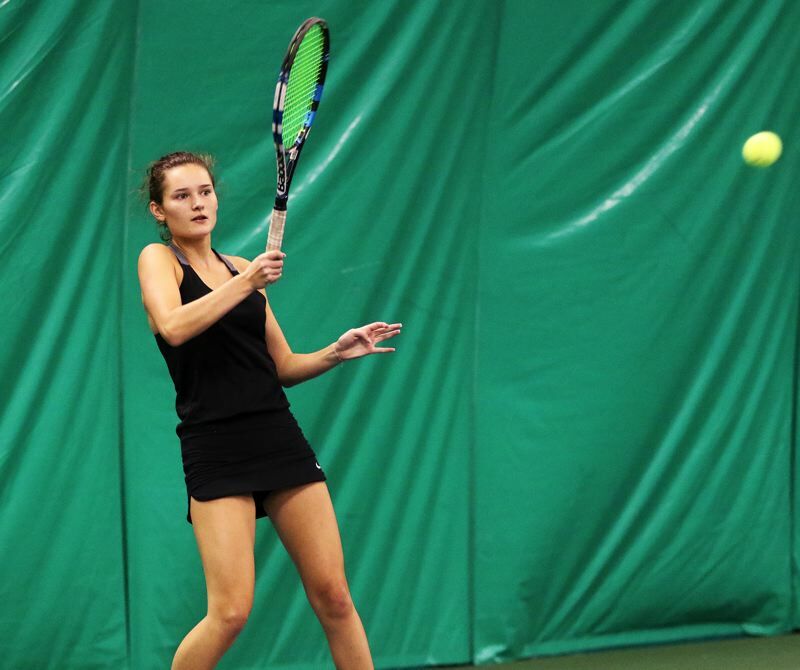 Tualatin High School junior Jensen Barnes made a return to the state tournament, in girls singles play, after missing out last year. And she made it a successful return, as she opened play with a 6-1, 6-1 victory over Madison senior Grace Lee in a first-round match. "It went pretty well," Barnes said after the win. "I'm sick right now, so I'm not playing very well, but I had to push through." In that match, Barnes dropped the opening game of the first set, but she came back strong to win 12 of the next 13 games. "This feels good," she said. "As a freshman, I won in the first round, so I feel like I'm making it back to that point, where I'm winning again, so that feels good." Barnes lost 6-1, 6-1 to Abdelmoneum in a second-round match. 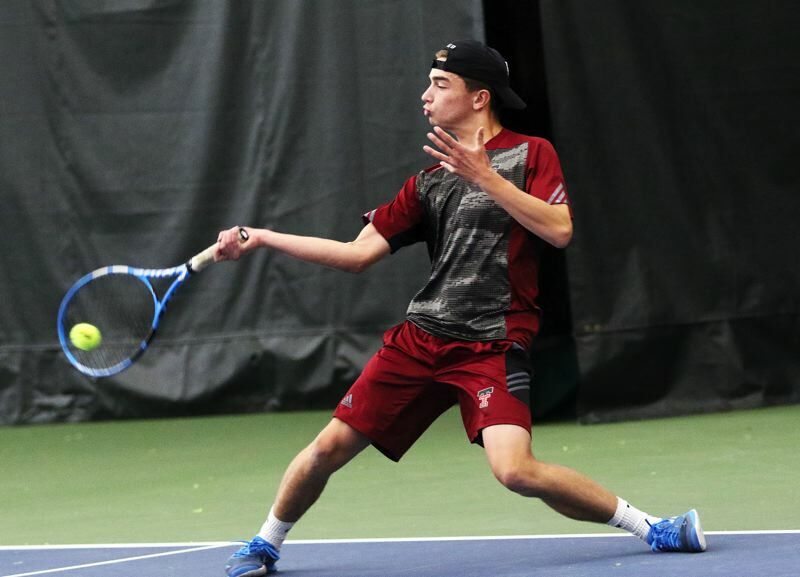 Tualatin senior Will Havenar, in boys singles play, opened the state tournament by getting a 6-7, 6-3, 6-3 win over David Douglas senior John Bui in a first-round match. In the second round, Havenar lost 6-0, 6-4 to third-seeded Abraham Shugar of Lincoln. The Lake Oswego girls and Jesuit boys won the Class 6A state team titles. The Tigard girls, with Stevens as their only entrant, finished in a tie for fifth place in the team standings.